NORSAR becomes the first non-US node on ARPANET, the predecessor to today's Internet. When NORSAR was officially opened in 1970, selected data from the NORSAR seismic array were transmitted to the Seismic Data Analysis Center (SDAC) in Virginia via the Nordic satellite station in Tanum, Sweden. The transmission capacity was 2.4 Kb/s. In 1968, the US Advanced Research Projects Agency (ARPA) had decided to fund a large network project based on the principle of decentralized packet-switching. The network was operational in 1969 and was named ARPANET and is the predecessor to what is now commonly known as the Internet. In 1972, representatives from ARPA visited Norway to inquire about the possibility to expand the ARPANET to Norway and connect NORSAR's computers to the network. To accomplish this, a TIP (Terminal Interface Processor) was to be placed at NORSAR with a direct link to SDAC in Virginia. In addition, ARPA wanted to place a node in London and to establish a direct link with a transmission capacity of 9.6 Kb/s to the node at Kjeller. As the first ARPANET connection outside the United States, NORSAR's TIP was installed in June 1973. 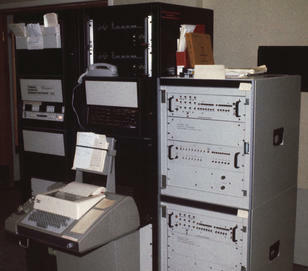 Shortly after, NORSAR's two IBM mainframes were connected. At about the same time, a TIP in London was installed and a communication link from Kjeller to London was established. In the beginning, NORSAR's ARPANET-connection was primarily used for seismic data exchange. As the network grew and more international connections were established, NORSAR's TIP gave acces to other Norwegian research organizations. During the period 1981-1983, the ARPANET went through a major upgrade. The old transport protocol NCP was replaced with the TCP/IP protocol which allowed different networks to connect. Because computer scientists referred to a network of networks as an internet, this new set of networks using TCP/IP became known as The Internet.